If you love being creative and making unique works of art then ARt Workshops in Sutton is for you. It's also a fantastic place to relax and enjoy some quiet, adult time! If you enjoy being creative and relish the chance to make craft items for yourself rather than just with your children, you will be pleased to hear about a new workshop designed with mums in mind. "Our new workshops�promote a relaxed creative atmosphere," explains�Adrienne, a ceramic artist and qualified art teacher. �"You can come and learn a new skill while making your own unique craft in clay." 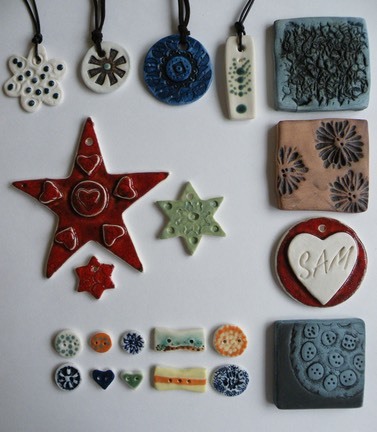 There is an opportunity to try out a variety of clay techniques with a choice of workshops which include decorative tiles workshop, personalised plaques workshop, sculpture workshop, buttons and jewellery workshop and Christmas decorations workshop. "I use a wide variety of media in my art workshops and teaching," says Adrienne, "But I have particualrly enjoyed seeing many children and adults over the years discovering the magical properies of working with clay." "I understand their delight at seeing how the surface can be changed to reflect different textures and mark making that they have made," adds Adrienne. All the work done during the workshop is fired in the studio ready for your collection. Taster sessions are also available for those thinking of taking up pottery classes. Workshops are on Mondays and Tuesdays, morning/afternoons or phone Adrienne for alternative times.�Visit�www.facebook.com/artworksinspire�for examples of workshops.